Think of this as a sort of Italian mole -- it resembles that famous Mexican specialty in that it's a savory meat dish served in a rich, complex sauce made with a somewhat surprising ingredient: dark chocolate. 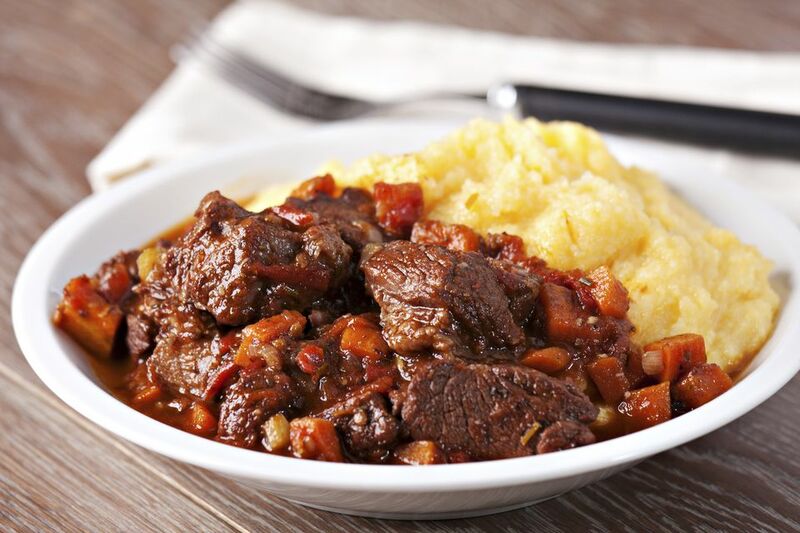 This traditional Tuscan recipe dates back to the Renaissance and -- since wild boar can be very difficult to find in the United States -- you can substitute any type of hearty game meat (such as venison or rabbit) or, lacking that, stew beef or pork shoulder. If using wild boar or other game meat, it needs to marinate for 48 hours -- with other meats, such a long marination time is optional. It's a great Sunday supper dish for cold weather, or an impressive dinner party main dish, and it can be served with creamy polenta, mashed potatoes, wide buttered egg noodles or a wide pasta such as pappardelle. In a large, heavy-bottomed pot, bring all of the marinade ingredients to a boil, then remove from heat and let cool completely. Submerge the chopped raw meat in the marinade and refrigerate, covered, for 48 hours. Strain the meat and vegetables out of the liquid (retaining the marinade liquid). Separate meat from vegetables and discard vegetables and bay leaf. In a large, heavy-bottomed saucepan or Dutch oven, heat the garlic in the olive oil just until it turns lightly golden. Add the onion, carrot, and celery and saute until vegetables are softened and onion is transparent, about 6 to 8 minutes. Add the chili pepper flakes and saute for another 30 seconds. Stir in the prosciutto and saute for about 1 minute. Pat the pieces of meat with a paper towel until dried well, then add to the pot and stir just until browned. Pour in the strained marinade liquid and bring to a simmer, scraping the bottom of the pot with a wooden spoon to loosen any browned bits. Add the bay leaf. prunes and sugar and return to a simmer. Cover and let simmer over low heat until meat is very tender, about 2 hours. When meat is tender, stir in the orange zest, raisins, pine nuts, and grated chocolate. Stir until chocolate is melted and all ingredients are well combined. Taste and adjust seasoning with salt and pepper, as necessary. Serve over creamy bowls of polenta, sprinkled with finely chopped fresh parsley.